Classical Astrologers hold the view that the Enlightenment brought about a profound shift in sensibility that was detrimental to the craft of astrology. While many of us would accept this as a matter of course, we have been educated within the matrix of post-Enlightenment thought. There are two assumptions that seem to be particularly difficult to overcome: 1) that the test of astrology is whether it “works”, or more specifically, that we can demonstrate that the movements of the planetary bodies have a demonstrable effect on our material existence; and 2) that astrology was “discovered” by Ancient scientists through observation of the material world as Modern scientists “discover” natural phenomena. The second assumption must fall to the wayside when we consider the planetary rulerships for the days of the week. Planetary Lords and Ladies of the Day are used in many different contexts in Classical Astrology, such as horary and electional work, and in calculations such as the Almuten Figuris. Despite this, even though there is arguably a physical basis to a seven-day week (seven-days being roughly the quarter cycle of the Moon), I can not see that there is any plausible argument for a purely physical basis for the planetary rulerships of the specific days. There is a discernible pattern in the assignment of rulerships to the days of the week, starting with the Sun and the Moon, and moving outward on an alternating basis from each of these luminaries. To be honest, I can only speculate on the reason for this pattern; however, it is very likely to be a spiritual and metaphysical reason, and not a physical one. Interestingly, during the Enlightenment, in the West, there there were Protestants, such as the Puritans and the Quakers, who stripped the days of the week of their planetary correspondences to remove the “pagan” influences. Quakers today still use numbered days, such as First Day and Second Day. The planetary correspondences for the days of the week seem to transcend cultures. One finds the same associations for the day of the week in Eastern religion and philosophy as in the West. Recently, I have been immersed in the study of the Japanese language. Japanese has three different sets of characters for writing. There are two phonetically based “alphabets,” hiragana and katakana. In addition, there is a third set, kanji, which are symbolic characters derived from Chinese writing. Japanese school children are expected to learn around 2,000 different kanji by the time they graduate high school. Among the earliest kanji learned by Japanese school children are the ones for the days of the week. In Japanese, the days of the week are named for the Sun and the Moon, and the five Eastern elements. The Eastern elements are not the same as the Western system of material elements, but instead directly correspond to the five non-luminary planetary principles. 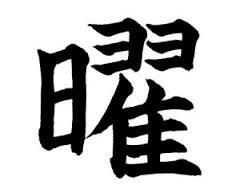 The first character in the kanji for each day of the week is the kanji for the luminary or Eastern element for that day. In Japanese, Sunday (the Sun’s Day) is nichiyoubi, or 日曜日. As the reader can see, the character for the Sun is the first character in this kanji. Monday (the Moon’s Day) is getsuyoubi, or 月曜日. The kanji for the Moon looks a bit like the Sun on legs, which fits well with the light of the Moon being the reflection of Solar Light. Astrologers are well aware of the Moon as the governess of the most intimate details of our physical existence. Thursday (Jupiter’s Day) is mokuyoubi or 木曜日 (Wood Day). Wood is associated with the Jovial principle. The character at the beginning is 木, which is the kanji for tree. As an aside, one of my favorite words in Japanese also contains the radical for tree in it. The word is komaru or 困る. The word is does not have a precise English translation, but it means being stuck, confused, or unable to move or proceed. The kanji has a tree in a box, unable to grow. In a sense, when the Jovial principle is blocked, we often become komaru. Friday (Venus’ Day) is kinyoubi or 金曜日(Gold Day). Gold, or Metal, is associated with the Venusian principle. The first character in the kanji, 金, is the same as the kanji for kane, or money. The Venusian association with material wealth, prosperity, and money is a strong one. Sri Lakshmi, of the Vedic tradition is strongly associated with both material wealth and the Venusian principle. Lastly, Saturday (Saturn’s Day) is doyoubi or 土曜日 (Earth Day). Earth is the Eastern element associated with the Saturnine principle. In the kanji for Earth, 土, the cross of matter is firmly planted on the ground. 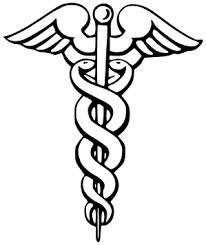 This symbol is strikingly similar to the glyph for Saturn, with the cross of matter on top of the lunar soul. Also of interest is that the kanji for the number ten 十 is also the cross of matter. I am still very much a novice in the study of Japanese. There are calligraphers and sages of great wisdom that devote their lives to the study of the mysteries of kanji. Yet, it seems there is profound metaphysical wisdom even in the very basic kanji learned by Japanese elementary school children, as can be seen in the kanji for the days of the week.